› Author AffiliationsThis project was supported by the Natural Science Foundation of Zhejiang Province [LY16H300001 (G. Zhang), LY18H300001 (W. Chen)], the National Natural Science Foundation of China (81473074 and 81673291) and the Osteoporosis & Breast Cancer Research Center, USA (Y. Yu). 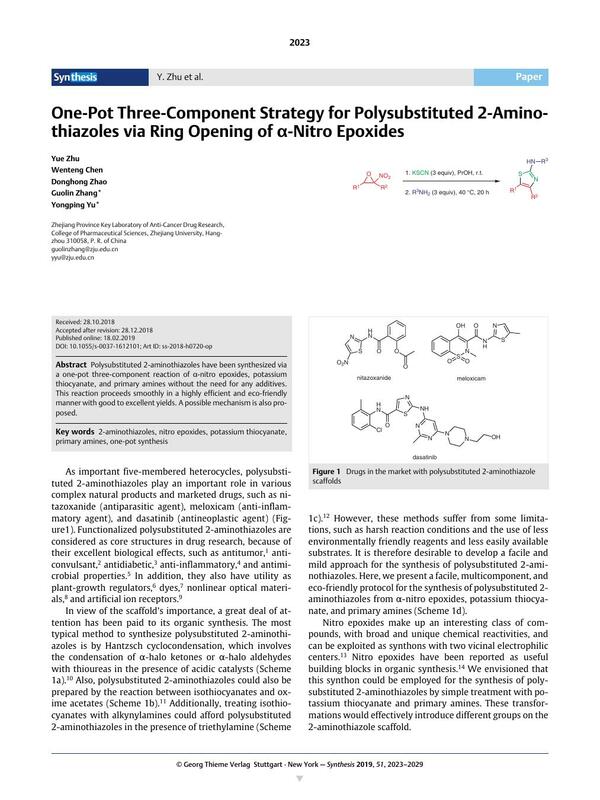 Polysubstituted 2-aminothiazoles have been synthesized via a one-pot three-component reaction of α-nitro epoxides, potassium thiocyanate, and primary amines without the need for any additives. This reaction proceeds smoothly in a highly efficient and eco-friendly manner with good to excellent yields. A possible mechanism is also proposed. Supporting information for this article is available online at https://doi.org/10.1055/s-0037-1612101.